Domagoj Beslic, in red, chases down a ball in Hamilton's semifinal victory over Toronto last weekend. Larry Moko, The Hamilton Spectator — Hamilton Croatia will attempt to cap its inaugural season of play in the Canadian Soccer League with a championship this weekend. The Hamilton men’s squad takes on Brantford Galaxy – another first-year entry—for the CSL title Sunday at 2:30 p.m. at Etobicoke’s Centennial Stadium. The game will be broadcast live on Cable 14. The two sides tied both of their regular-season meetings, 2-2 at Brian Timmis Stadium and 3-3 in Brantford. Hamilton finished third in the standings, just two points out of first place (13-6-5), while the Galaxy ended up seventh (9-10-5). 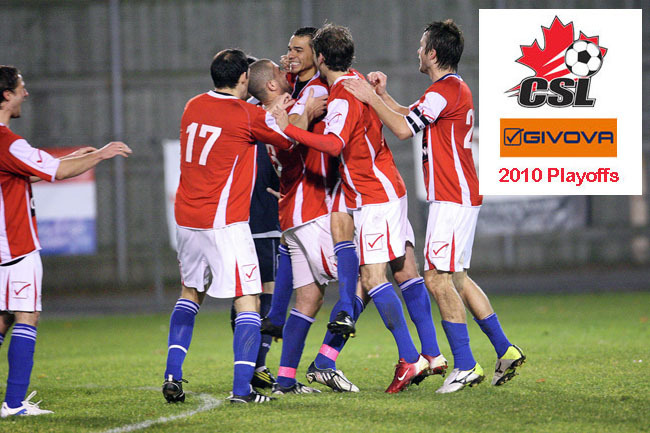 In the semifinal round of playoffs, Hamilton blanked Toronto Croatia 2-0 and Brantford topped Portugal FC 5-3. Hamilton is riding a nine-game winning streak. A Brampton resident, James previously suited up for Chicago Fire of the MLS and Panama City of the USL’s Premier Development League. Davidson says the team’s defenders have been solidly consistent during the winning streak. That group is comprised of Ivan Razumovic, Alvin Hudson, Tom Bilic and Peter Tereanszki-Toth. Aidan O’Keefe of Hamilton Croatia led the league in scoring with 14 goals. Jamie Dodds and Preston Corporal have also scored key goals in the playoffs. Davidson says both teams finished amongst the leaders in goals-scored this season. He points out the Brantford has an experienced roster loaded with as many as nine imports. Hamilton has three imports — foreign players brought in temporarily just for the CSL season. 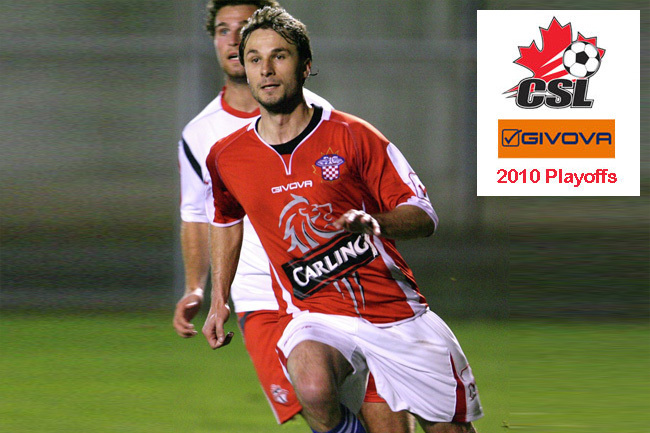 Ranko Golijanin of the Galaxy scored three goals last weekend during Brantford’s semifinal victory over Portugal FC. Golijanin formerly played for Hercules FC in the Spanish First Division and Milwaukee Rampage of the USL. Tickets at the gate are $25 for adults, $10 for those 17 and under and free for children 6 and under. Advance tickets, for $20, can be purchased online at www.canadiansoccerleague.com. The league’s annual awards will be presented at 2:15 p.m. Sunday. Just before the final, the Hamilton Croatia U-12 team will play a mini game against the Oakville Soccer Club’s U-12s. Croatia players swarm Adam Leggett after his second-half goal against Toronto. Frank Perin — Hamilton scored once in each half and goalie Melford James Jr. recorded the shutout in a 2-0 victory over Toronto in the all-Croatian CSL Playoff semifinal played at Brian Timmis Stadium on Sunday night. The result will bring together two first-year CSL clubs in Hamilton and the Brantford Galaxy in the Playoff Final on Halloween Sunday afternoon. The Galaxy earned a spot in the final by defeating fifth-seeded Portugal FC 5-3 on Friday. Hamilton striker Aidan O’Keefe put his side up at 27 minutes. O’Keefe attempted to bend free kick around a Toronto Croatia wall from about 25 yards out, but the shot redirected off of a Toronto player in the wall and went in the opposite direction of goalkeeper Sandi Matika into the net for a 1-0 lead. Toronto tried hard for an equalizer, which included point-blank chances by the CSL’s top-scorer Tihomir Maletic, but outstanding goalkeeping by “Primetime” — as the Hamilton fans have nicknamed James — kept the score at 1-0 into halftime. The home side was able to double their lead in the 54th minute. The goal came from a throw-in to Hamilton forward Preston Corporal who moved the ball to midfielder Adam Leggett. Leggett slid the ball calmly from right-to-left across the top of the penalty area and struck the ball with his dangerous left foot back across the face of goal into the lower right corner of the net. The Hamilton defence played tightly, and Primetime was definitely on his game. His multiple acrobatic saves sucked the life out of Toronto Croatia’s aggressive attack, and the 2-0 score held until the final whistle. The Canadian Soccer League’s five-month long season will culminate on Sunday and one of the participating clubs will be crowned Playoff Champion in its inaugural year of competition. Croatia have won their past nine games in a row and look to cap the season with their tenth straight in the final. Hamilton and Brantford have met twice this season. Danny Jirta and Aidan O’Keefe scored as Croatia came from two goals down to earn a 2-2 draw at BTS back on June 11th. The team’s also drew 3-3 at Lions Park in Brantford on July 18th. The final is this Sunday, October 31 — HALLOWEEN — at 2:15 p.m. at Centennial Stadium in Etobicoke. Tickets for the game are $20 in advance and $25 at the gate. All Hamilton Croatia supporters are encouraged to pre-purchase their tickets from club members as half of the proceeds of all tickets the club sells comes back to the organization. Please email Mike Radencic, Mark Vuksan, Allan Perin, Frank Perin, or Ivan Rados (for those in Oakville) to get your tickets today! There will be a tailgate party at The Centre, 166 Green Mountain Road beginning at 10 a.m. All fans are encouraged to come join the HammerHeadz in the pre-game festivities which will include BBQ and drinks! You can also buy your tickets from us that morning. We are currently working on getting a bus for fans, but it will only happen if there is enough interest. Please post in the forum thread “SUNDAY! CSL Final Bus & Tailgate” if you would like to hop in with the hardcores! Frank Perin — Hamilton Croatia completed the season sweep of TFC Academy on Sunday with a 1-0 victory in the second leg of their quarterfinal matchup. It was the team’s eighth win in a row and advances them to the CSL Playoff Semifinals. Hamilton went into the game needing only a tie after their 2-1 win over the Academy in the first leg played on October 13 in the rain at Centennial Stadium. The clear skies on Sunday brought about a boisterous crowd on both sides of the bleachers, but it was the Croatian fans who sang last. Forward Preston Corporal scored the lone goal at 70 minutes from a play started by Daniel Niksic. The Hamilton midfielder started the play on the right side and found Aidan O’Keefe down the left flank. O’Keefe pushed the ball forward for Corporal who drove it perfectly into the lower right corner of the net well out of reach of TFC goalkeeper Angelo Cavalluzzo. Corporal also scored in the first leg which snapped a personal scoring slump dating back to July 30. With forward Jason Shannon out with a concussion since the October 5 match against Milltown FC, the two goals could not have come at a more opportune time. Niksic had an outstanding game in the midfield, and Hamilton goalkeeper Melford James Jr. came up with numerous momentum changing stops during the game, including one brilliant game-saver in the 90th minute to preserve the shutout. 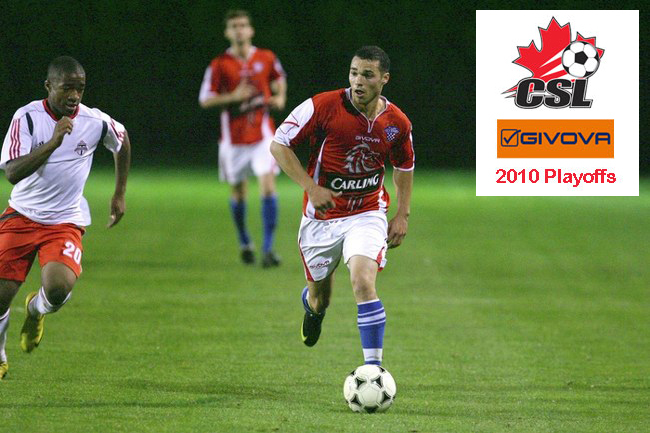 In the other quarterfinal matchups, Toronto Croatia held York Region Shooters to a 1-1 draw to advance 3-1 on aggregate and Brantford Galaxy scored the golden goal at 11 minutes of extra time following 190 minutes of goalless soccer against the White Eagles to also advance. Fifth-seeded Portugal FC tied Milltown 2-2 on Saturday to go through 3-2 on aggregate. With York and the White Eagles — the top two seeded teams — eliminated, it sets up a home semifinal date for Hamilton Croatia against Toronto Croatia, while Portugal FC will play host to the Galaxy. Hamliton’s semifinal will be played this Sunday, October 24 at 7 p.m. at Brian Timmis Stadium. Tickets for the game are $15. Season’s passes are not valid for playoff games, but holders can show their pass and will be entitled to a $5 discount at the gate. There will also be another tailgate party at The Club, 200 Kenilworth Avenue North beginning at 4 p.m. All fans are encouraged to come join the HammerHeadz in the pre-game festivities which will include BBQ and drinks! Posted in A-Team | Comments Off on Hamilton’s On Fire! Ivan Razumovic scored in his second straight game. Frank Perin — A goal at 84 minutes by defender Ivan Razumovic gave Hamilton Croatia a 2-1 victory over TFC Academy in their quarterfinal first leg playoff game at Centennial Stadium in Etobicoke. It rained prior to the game and in spurts during the game, but that did not dampen the spirits of the TFC and Hamilton Croatia fans who have quickly developed a friendly rivalry trying to out-chant and out-sing eachother in the stands. Hamilton Croatia took the lead at 32 minutes on a low drive from 20 yards by forward Preston Corporal, after he received a perfect 30-yard through-ball by Daniel Niksic. The 1-0 score stood until halftime. TFC Academy tied the game on a goal at 51 minutes. Defender Ashton Morgan struck a seeing-eye knuckler from 35 yards that looked as if it had caught Hamilton goalkeeper Melford James Jr. off guard and went into the top left corner off James’ hand. The home side then had an opportunity to go in front at 78 minutes when awarded a penalty kick by referee Justin Tasev. The tripping incident inside the box was questioned by three or four Croatia players who had a differing opinion of the call. The kick was taken by Keith Makubui, but James Jr. came up with the save to keep the game locked at 1-1. Hamilton had the edge in the second half. Striker Aidan O’Keefe missed an empty-net opportunity from six-yards out and later, a shot off the cross-bar looked as if it had fallen across the goalline before spinning away from the net but no signal was given from the linesman. However, an unlikely hero emerged in Ivan Razumovic. The Croatian defender beat an offside trap and headed home his second game-winning goal in as many games in the 84th minute. With the 2-1 win, Hamilton Croatia can clinch a semifinal berth with a win or a tie at Brian Timmis Stadium in the return match. The second leg will be played this Sunday, October 17 at 7 p.m. at Brian Timmis Stadium. There will also be a tailgate party at The Club, 200 Kenilworth Avenue North beginning at 4 p.m. All fans are encouraged to come join the HammerHeadz in the pre-game festivities which will include BBQ and drinks! TFC's Joshua Janniere tries to track down Hamilton's Adam Leggett at BTS back on September 17. Frank Perin — Hamilton Croatia hopes that their first-ever CSL Playoff game resembles their first ever CSL regular season game — a road win against TFC Academy. The team hits the QEW tonight for their first leg quarterfinal matchup against the TFC Academy at Centennial Stadium in Etobicoke. Kickoff is 9 p.m.
Hamilton was two-for-two against the Academy this season. The last time the two teams met was on September 17. Croatia spoiled TFC’s first-place aspirations as Jamie Dodds and Danny Jirta scored in a 2-1 win at Brian Timmis Stadium. Croatia also won their inaugural CSL game against TFC by the same score at Lamport Stadium back on May 15. After finishing third overall, Hamilton had the right to choose whether they would play at home or away in the first leg and chose the latter. The second leg will be played on Sunday, October 17 at 7 p.m. at Brian Timmis Stadium. The three other quarterfinal matchups began last night. Eighth-seeded Toronto Croatia scored an upset 2-0 victory over league-leading York Region Shooters, number five Portugal FC played well enough to defeat Milltown FC 1-0, and in an exciting encounter Brantford Galaxy and the second-place White Eagles played to a 0-0 scoreless draw. The four surviving teams will advance to the semifinals, the venues to be determined by the higher seeds. The CSL Championship Final will be played at Centennial Stadium on Sunday, October 31 at 2:15 p.m. with the annual award presentations to follow. Posted in A-Team | Comments Off on It’s Playoff Time! Hamilton Croatia	is proudly powered by WordPress 5.1.1	| Entries (RSS) | Comments (RSS). 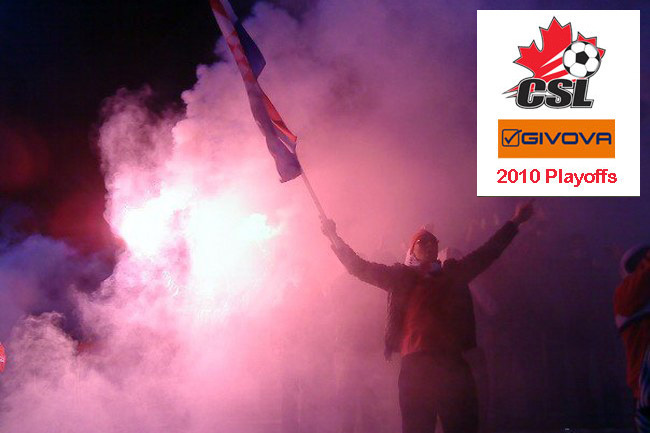 (c) 2011 Croatian Sports and Community Centre of Hamilton, Inc.